Cpl. Wilfred Samuel Clunk was the first soldier from Lisbon to be killed in World War II. He was killed in action on Sept. 9, 1943 while serving in the 132nd Field Artillery Battalion, Battery B in North Africa, and the local VFW Post 4111 was named after him. 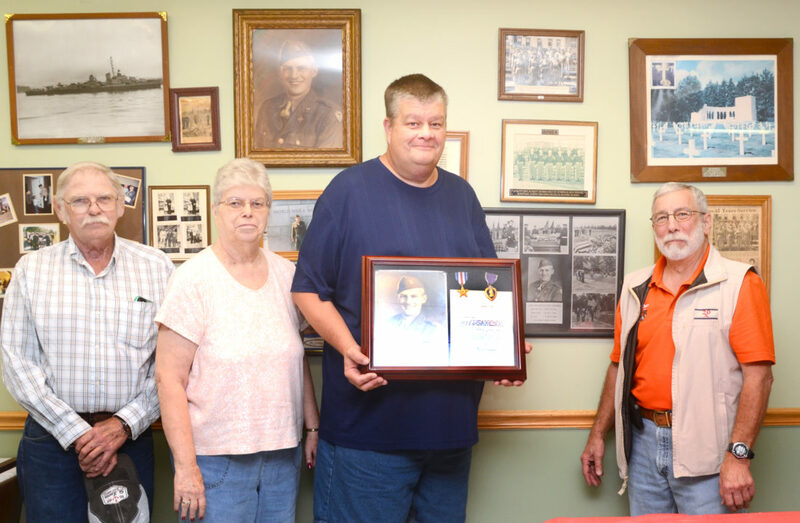 On Saturday Clunk’s medals, the posthumously awarded Purple Heart and his Silver Star, were given to the VFW at their grand reopening by Clunk’s grandson, Wilfred Paul Clunk Jr. of Salem, and Clunk’s daughter-in-law, Nancy Clunk of Salem. The medals and a letter written to Clunk’s widow, Maxine N. Clunk, were donated by Vance Adams of Lisbon who married Maxine Clunk following Wilfred’s death. Shown here with Cpl. Wilfred Samuel Clunk’s medals and the letter to his widow are, from the left, VFW Post 4111 commander David Cope, Nancy Clunk, Wilfred Paul Clunk and VFW Post 4111 trustee Roger Bacon.